1. Place steaks and 1/3 cup marinade in plastic bag, turning to coat. Close bag securely and marinate in refrigerator 30 minutes, turning once. 2. Meanwhile in small bowl, combine salsa ingredients; set aside. 3. Remove steaks from marinade; discard marinade. Place steaks on grid over medium, ash-covered coals. Grill chuck eye steaks, uncovered, approx. 14 to 20 minutes (top blade steaks 17 to 22 minutes) for medium-rare to medium doneness, turning occasionally. 4. 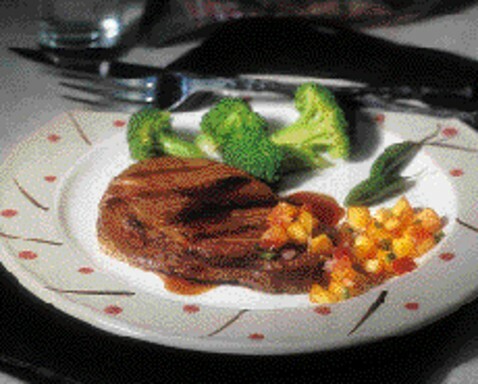 Drizzle steaks with 2 tablespoons marinade; serve with salsa. 4 servings.